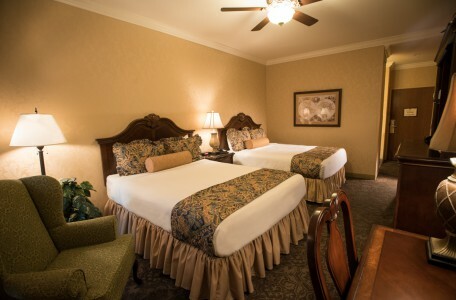 The Fulton Steamboat Inn offers three elegant decks of unique room types to choose from, and all of our guest rooms are designated as non-smoking! 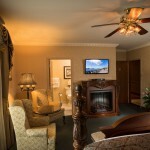 All on-board hotel accommodations include unique Nautical or Victorian furnishings, individual climate control, 32″ flat panel LCD TV, a Blu-Ray DVD Player, AM-FM clock radio, direct dial phone, refrigerator, microwave, hairdryer, iron and ironing board, and an in-room coffeemaker. 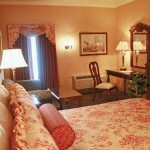 Our third floor offers beautifully decorated Victorian themed rooms with private balconies. 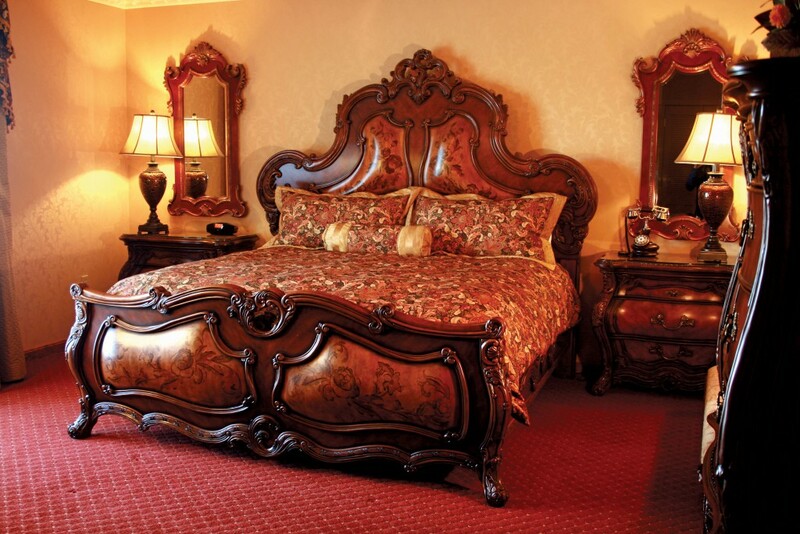 Either an over-sized king or two queen-sized beds with stunning and unique Victorian furnishings are available on the Sun Deck. 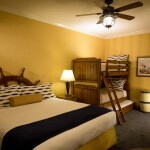 All guest rooms on the Sun Deck offer sitting chairs with an activity table and a ceiling fan. They are located down the hall from the fitness center. 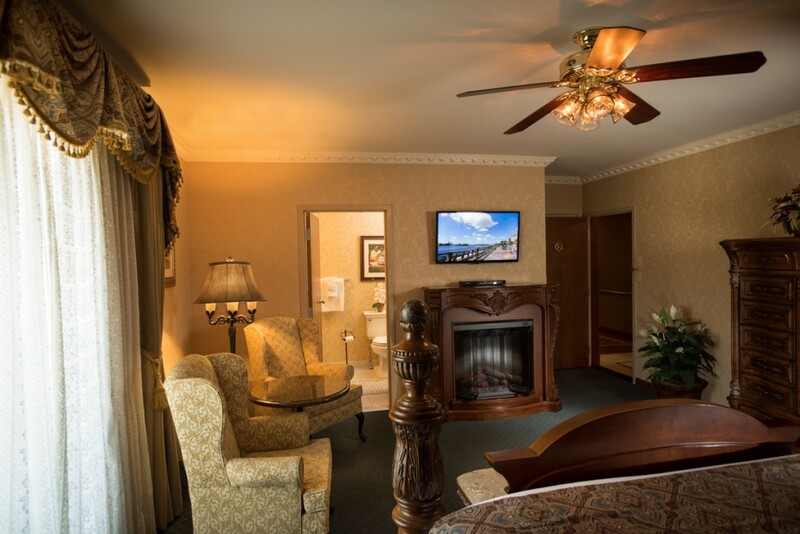 The Captain’s Lounge offers a quiet seating area overlooking beautiful Lancaster County that is available to our guests staying on the Sun Deck. 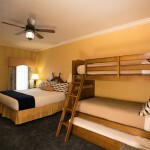 All of our Sun Deck guest rooms may be reserved for passengers over the age of 16. The second floor features beautifully decorated Nautical and Victorian themed Steamboat accommodations with either two queen-size beds or a king bed with a sleeper sofa. The game room is also located on the Observation Deck. 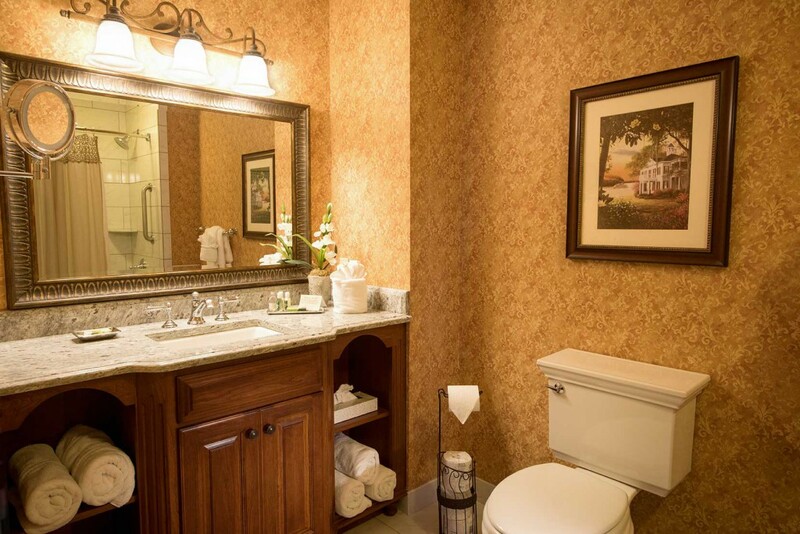 A beautiful view of Lancaster County from your guestroom completes the unique experience. 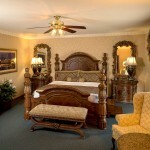 One of the many reasons the Steamboat is considered to be one of the best and most memorable hotels in Lancaster PA. 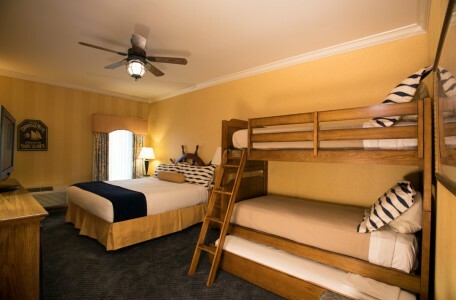 The first floor features Nautical and Victorian themed accommodations with either two queen-size beds, a king bed with a sleeper sofa, or a king bed with a set of bunks, and trundle bed! All of our family favorite King with Bunk, and Trundle Bed guest rooms on the Promenade Deck are complete with a ceiling fan! 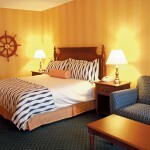 The heated indoor pool and whirlpool is located just down the hall on the Promenade Deck! 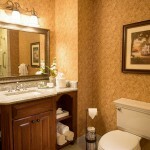 Guest laundry facilities are also located on our first floor, adjacent to the Indoor Pool and Whirlpool. And, of course, as a guest, you will enjoy the full range of hotel services and amenities available to all guests of the Fulton Steamboat Inn. 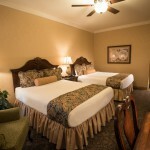 If you find a rate on a competing website that is lower than the lowest rate shown on the official Fulton Steamboat Inn website, the Fulton Steamboat Inn will honor that rate for the nights for which the lower rate was found, plus give you an additional 10% discount off the lower rate found upon its verification by the Fulton Steamboat Inn. For the purpose of the Lowest Internet Rate Guarantee, a competing website is defined as a web site that is not owned by the Fulton Steamboat Inn. Rooms on the other website must be publicly available, viewable and bookable on the Internet at the time of verification. 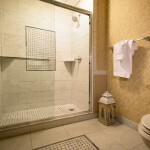 Lower rate found must be for the same type of accommodations and for the same dates. If a lower rate is found on a third party website, or is lower due to the currency exchange rate and/or rounding applied on the third party website, the Guarantee does not apply. 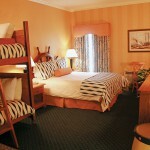 Guarantee does not include rates that have been negotiated by the hotel with corporations, membership rates (e.g. AAA, Entertainment Card, Industry Rates), corporate rates, government rates, promotional rates or travel agency rates; only publicly available rates apply. To use this Guarantee, you must advise the Fulton Steamboat Inn within 24 hours of booking your room by calling 717-299-9999 or by filling out the online Lowest Internet Rate Guarantee Form with your booking details. Book a one night's stay at the lowest available rate on the ‘Best Available’ search for the Fulton Steamboat Inn on the official Fulton Steamboat Inn website for a rate of $100.00. 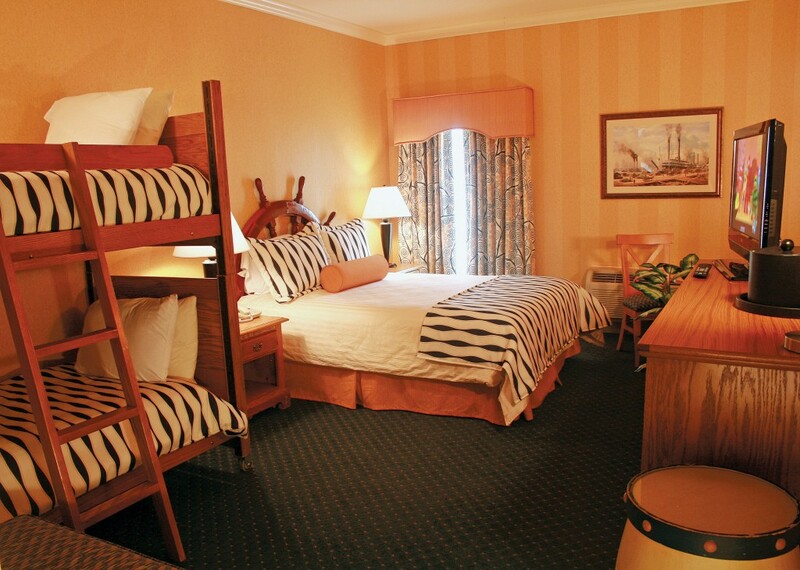 Within 24 hours, you find a rate of $90.00 through another website for the Fulton Steamboat Inn, same night and same room type (same number and type of bed(s). 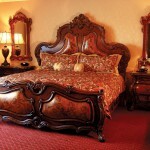 Contact Fulton Steamboat Inn to claim the Lowest Internet Rate Guarantee. Assuming your Fulton Steamboat Inn website booking is confirmed and the lower rate is available and bookable via a competing website, the Guest Relations team will modify your room rate to $81 to uphold our Lowest Internet Rate Guarantee policy! That's 10% better than the lower rate you reported. 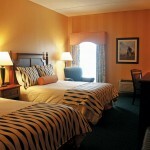 Stay content in the knowledge that you have booked the lowest Internet rate available for your room. 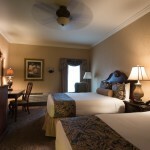 Finally, an Amish Country hotel like experience that guarantees you’ll receive the best rate and most relaxing stay. Make a reservation today, you have everything to win! 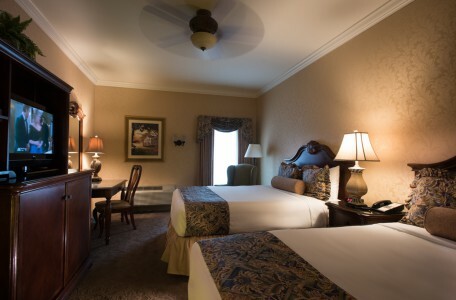 The Fulton Steamboat Inn requires a major credit card or one night cash or check deposit to confirm your room reservation. Please refer to your confirmation letter or email for the cancel policy. If you must cancel your reservation you must obtain a cancellation number from the Reservation Agent when you terminate or alter your arrangements in order to avoid a charge to your credit card or the surrender of the one night deposit. This number will clarify any disputes. To cancel or alter your arrangements, please contact us at 800-922-2229 or 717-299-9999. Check in time is after 3 pm and check out time is prior to 11 am. We collect information from you when you communicate with us via e-mail or use another site feature that requires your submission of personal information. Do we disclose the information we collect to outside parties? We do not sell, trade, or otherwise transfer to outside parties your personally identifiable information unless we provide you with advance notice, except as described below. 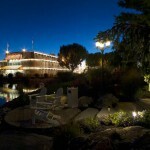 The term "outside parties" does not include Fulton Steamboat Inn. It also does not include Web site hosting partners and other parties who assist us in operating our Web site, conducting our organization, or servicing you, so long as those parties agree to keep this information confidential. We may also release your information when we believe release is appropriate to comply with the law, enforce our site policies, or protect ours or others' rights, property, or safety. However, non-personally identifiable visitor information may be provided to other parties for marketing, advertising, or other uses. How can you opt-out or remove information you have provided to us? To delete all of your online account information from our database, use our Contact Us form to send us a message with a subject of "Remove My Information." Please let us know what your email address is and we will delete all information relating to that address in our online database. 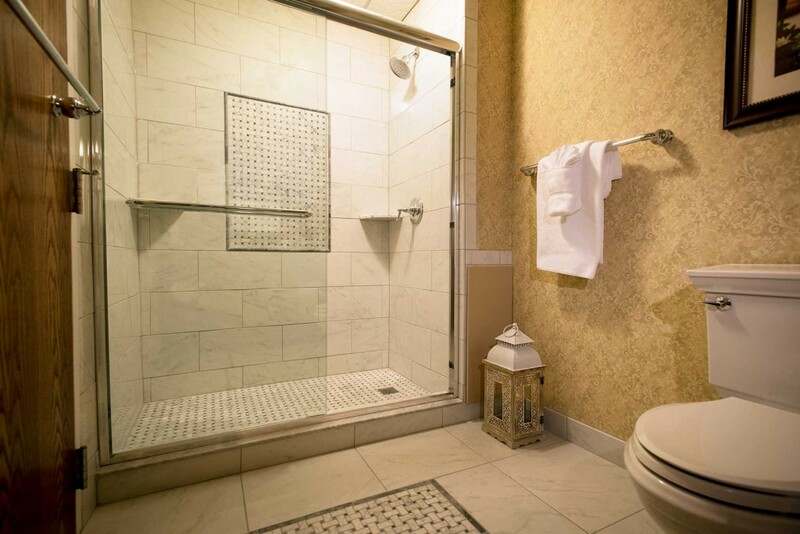 Sun Deck (Exclusively for Guests 16 and older) – our third floor offers beautifully decorated Victorian themed Lancaster PA lodging, with private balconies. 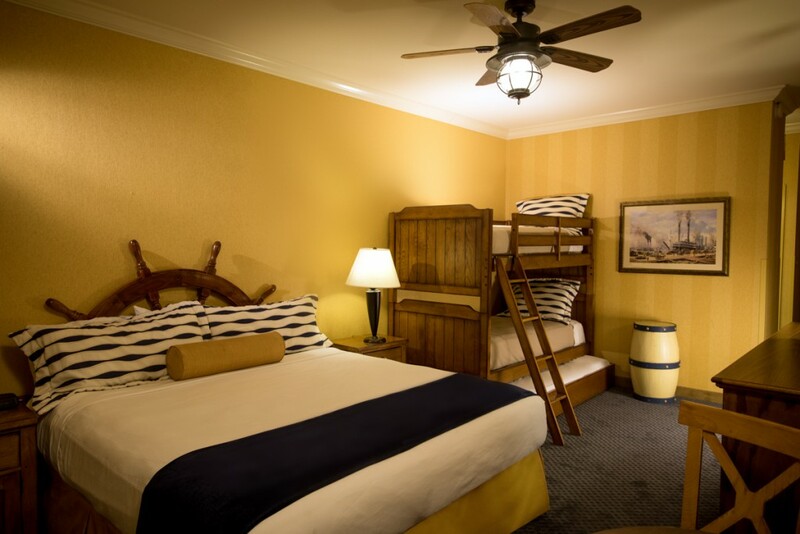 Plenty of room for the family in these Nautical themed rooms with multiple sleeping options. Be Queen for a day or a week, or however long you’d like to stay aboard. 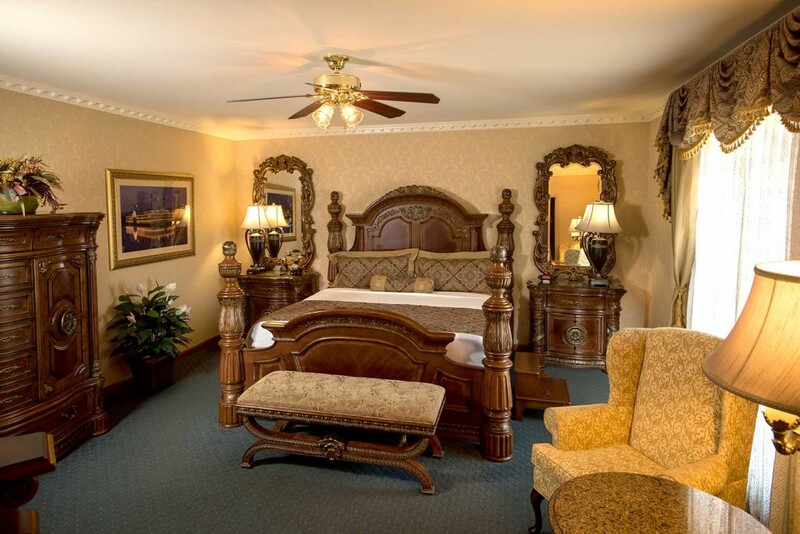 Stay in Victorian or Nautical style and when in port – enjoy touring the surrounding Lancaster County countryside and all it has to offer. 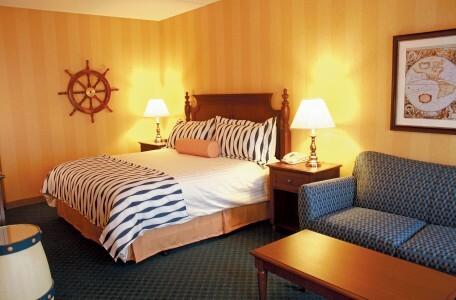 Enjoy your stay in our beautifully decorated Nautical and Victorian themed Steamboat hotel rooms with a king bed and sleeper sofa. 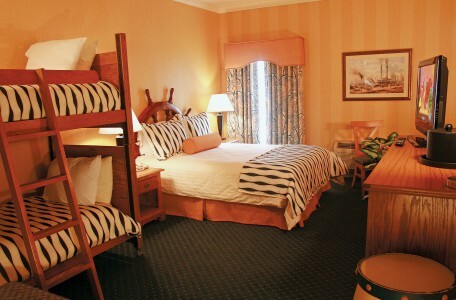 Being just minutes from many famous attractions, the Fulton Steamboat Inn is one of the most beautiful and affordable hotels near Dutch Wonderland.